In the summer of 2003 I designed and carved a totem about 16 feet tall to tell the story of our family. It is located at Balsam Lake, Ontario. The central characters represent my daughter (The Bear), my wife (The Squirrel) and myself (The Owl). The thunderbird is our family pet Darcy, an African Grey parrot and the lower character (The Big Fish, Nahma) represents where we met.The totem is made from western red cedar. Each character was carved separately and assembled to make the final pole. Four years later, in 2007, I designed and built the second totem to commemorate my wife's family. The base of this pole has graphic symbols to represent the many business that the Murray family has operated on Balsam Lake in Ontario over the years. The four characters represent my wife (The Squirrel, and the only character on both poles), her brother (The Raccoon), her mother (The Fox) and her father (The Loon). This totem stand close to the other and is also about 16 feet tall and was built using the same techniques the previous. When my daughter was married I wanted to do something to welcome my future son-in-law into the sculpted family. It wasn't suitable to carve a new totem pole since there likely would be children in the future and they would be left out of the work. So for a wedding gift, unveiled on the dessert table at the reception, I made these two figures for their garden. 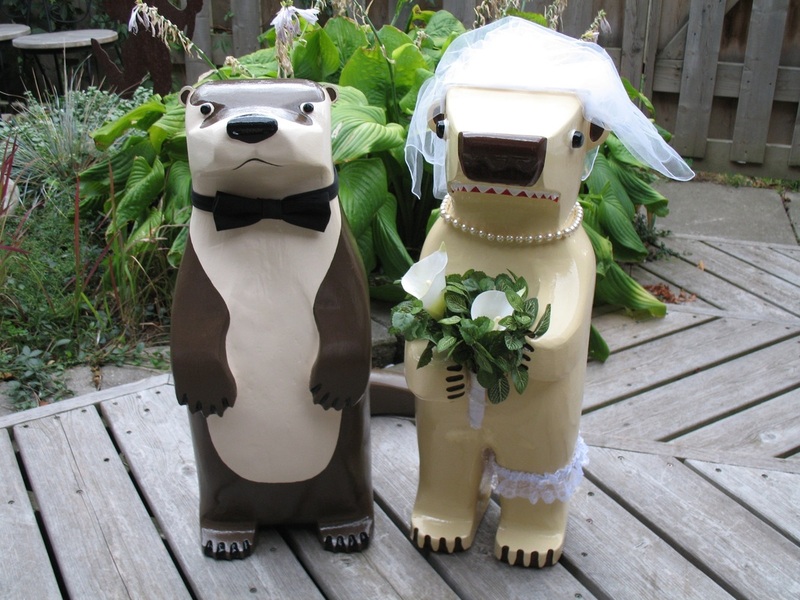 My daughter had to remain the bear, since that was her character on the existing pole, but I selected an otter for my son-in-law due to his playful nature.